Here is another polish from the Different Dimension Love's A Punny Thing collection. I was happily surprised when Missi chose my name "A Love Hue" for this polish. It fits it more perfectly than I would have thought! I used OPI My Boyfriend Scales Walls as my base, a super-pale grey creme. My nails above have one coat of A Love Hue over top, and I adore it! 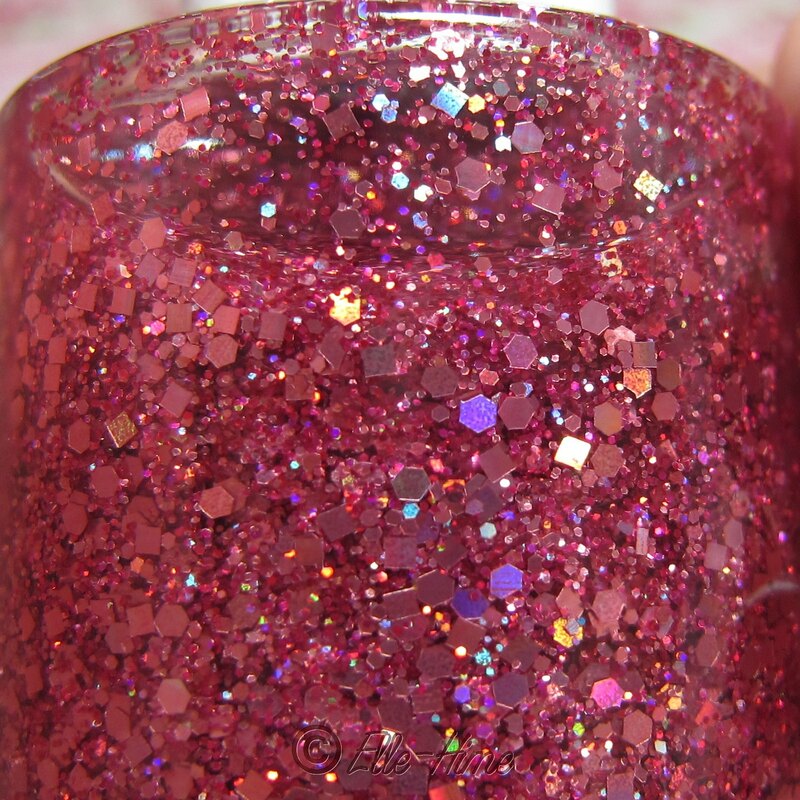 This polish is a mix of pink glitters, mainly this perfect holographic rose color. The larger pieces are squares and hexes, and there are lots of teeny glitters in both the rose color and a deeper pink. It makes for a perfect blend, all floating in a clear base. 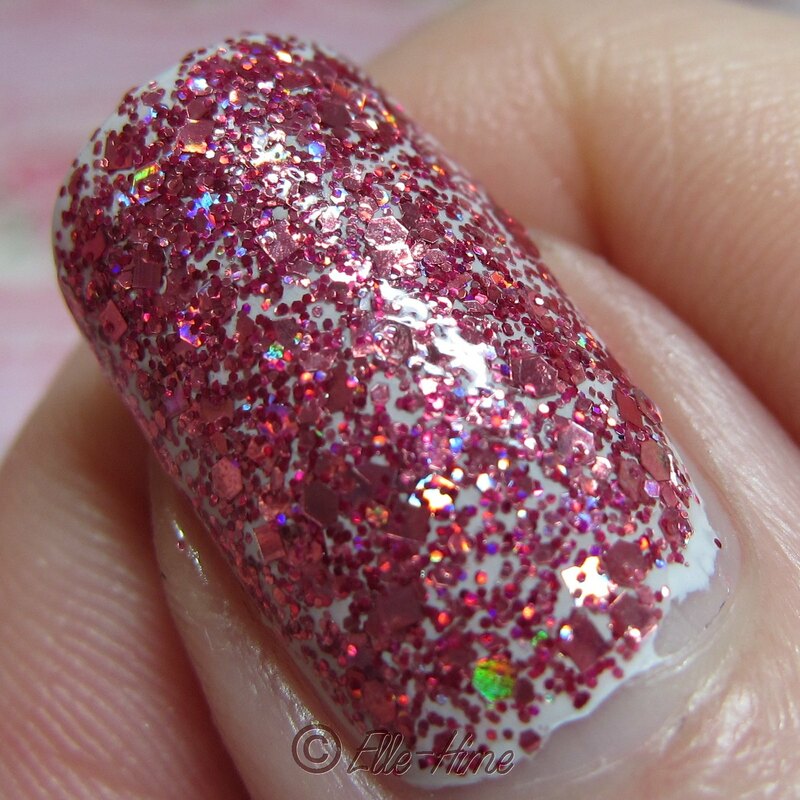 Here I took a macro of my thumb because I was trying to show the depth of the glitter at 3 coats. While it doesn't reach opacity it is very dense, and would probably appear opaque if you put it over a matching pink base. Once again this is 3 coats of A Love Hue. Pictures don't come close to showing just how sparkly and eye-catching this color is. The formula is very good. You get a lot of glitter on your nails even at one coat, and that is how I will wear it most. I was happy to see that even three coats didn't become a top coat devouring mess. The formula is thick enough that it never feels gritty and always spreads evenly. Whether you paint just one one coat or layer it on for glitterbomb nails you would need two layers of top coat for it to be perfectly smooth, but I'm just wearing one for these swatches. What do you think of Different Dimension A Love Hue? I personally love it! It has taken first place in my collection for favorite pink glitter topper. You can find it at the Different Dimension shop at etsy. that's have you thought to a lot of people know about this information.